I spent a big chunk of last week in Seattle, Washington and, as you might expect, I took a lot of pictures. I took a lot of pictures of doors, but it’s going to take me a while to sort through and organize them into the one or two collections of “Seattle Doors” that I can feature here later on in the year. As soon as I saw the letter box in the lobby of my hotel, I knew it was going to be the door I would feature. I worked for the Post Office for a few summers and I actually had to empty one of these boxes on my route. As it turns out, the Alaska Building was Seattle’s first skyscraper. It’s now a Courtyard, and sadly, it has the most uninteresting sliding glass door ever made. I lived in Seattle from September 1978 until July 1981. I always thought that the Smith Tower had been Seattle’s first skyscraper. I only discovered my error while visiting the observation deck of Seattle’s current tallest building, Columbia Center. The Alaska Building is accepted as the first steel frame skyscraper in Seattle. It was the tallest building for a brief span of two years (1904-1906). At 14 floors, it towered over the six-story Pioneer Building, but it quickly lost the title to the eight-story King Street Station. That’s not a typo, although I should have said the King Street Station Tower. I think the designation of “tallest” should be based on the practical aspects of the building. 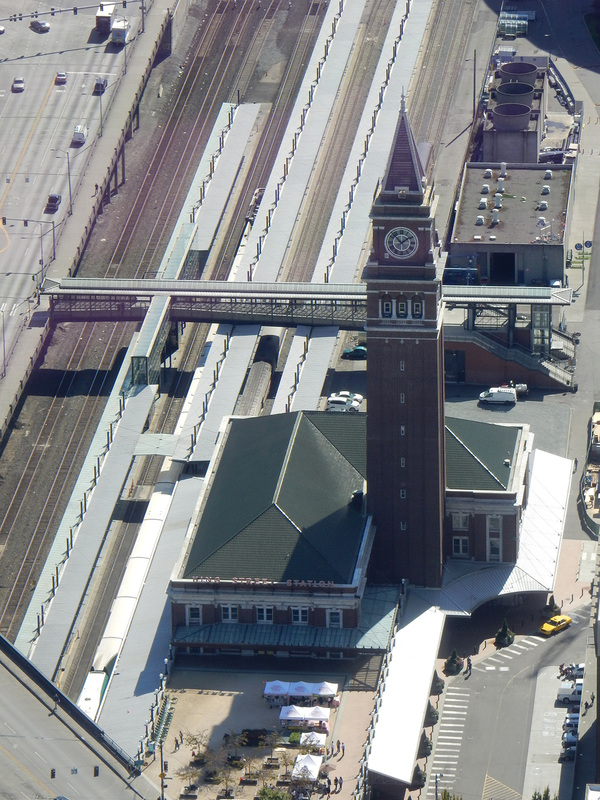 The King Street Station has a tall tower protruding from a relatively short building. Much the way today’s “tallest” of tall buildings often claim their height from the top of an antennae, I think the tall-thing-added-onto-my-building is kind of gaming it. The Smith Tower, with 38 floors in a functional tower-like section, held the designation as tallest building for about 55 years and recently celebrated its 100th birthday. You should check out the building’s website for a cool skyline comparison from 1914 to 2014. The Smith Tower was the tallest office building west of the Mississippi River until 1931 and was the tallest “structure” on the west coast until the Space Needle was built in 1962. At a mere 204 feet, my hotel, the Alaska Building is hardly tall by today’s standards. Still, I thought it was pretty cool that my room was on the 14th floor. Although the building’s description says that “the building rises 14 floors,” the elevator had a button for floor 15. Somewhat unusual in a hotel, there was also a button for floor 13. I hope you enjoy the photos of the other skyscrapers dotting the Seattle skyline. The photos were taken from the observation decks at the Columbia Tower and the Space Needle, and some were taken from good old terra-firma. There are a lot of photos today, but there are a lot of skyscrapers in Seattle. The building in the center is the Alaska Building / Courtyard Pioneer Sq. Behind it is the Smith Tower. Very distinctive, from any angle. This future skyscraper will include nine levels of below grade parking. The prominent building left of center is 1201 3rd Avenue which was once the tallest building. The Space Needle can also be seen (down there). This corner speaks from the past about the elegance of the Alaska Building. The rest of the lobby looks like a Courtyard Hotel Lobby. If there’s a plaque, I’m including it. Happy Birthday Smith Tower – all 42 stories. From the southeast corner looking up the Smith Tower. Walking down 3rd Ave, you get an idea of what it was like when the Smith Tower reigned supreme. The tall building slightly right of center is Columbia Center. This is from the Space Needle. Built for the 1962 Worlds Fair, it’s still an impressive structure. They voted to add the lower level restaurant when I lived in Seattle because the Needle was losing money. This post is part of Norm Frampton’s fascinating Thursday Doors series. You can see lots of other amazing doors and even join the fun with your own door. That one picture looks like the view from “Frazier’s” balcony in the the tv show. Trying to imagine how much money those characters had to make to support that lifestyle is a bit mind numbing. It is a beautiful city, but it’s an expensive place to live. 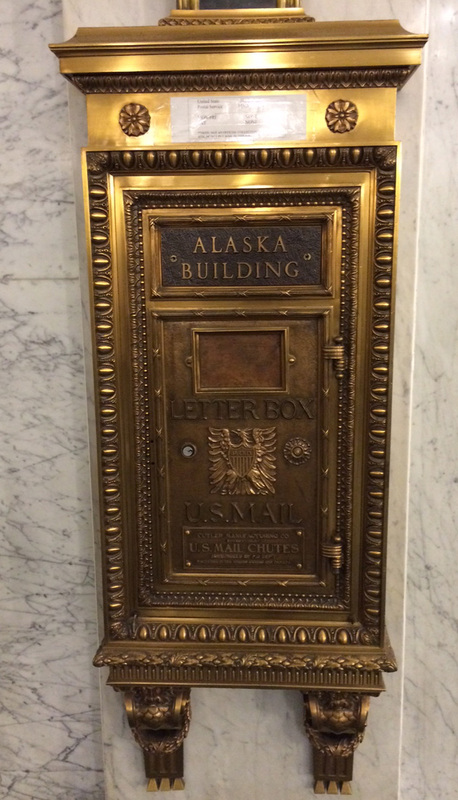 The Alaska building’s letter box is so elegant and ornate. I love it, Dan. Having your room onthev14th floor was brilliant. :) Hard not to focus on the letter box part of your post, though. I enjoyed the first skyscraper photograph and the stories you added. Smith Tower’s doors are just perfect. They lead to a stately and majestic older member of the Seattle skyline. I liked the Pioneer carved letters and arch. This was a beautiful morning “tour,” Dan. Thanks Robin. When I lived in Seattle, I didn’t pay much attention to Pioneer Sq area, which is the old part of the city. My meeting was within walking distance of this hotel so I decided to give it a shot. I’m glad I did. I think I like the Pioneer Building the best, especially with the way it’s painted. We have family outside Seattle, have been there several times, but it has been a while. Enjoyed your shots. :-) Postman, huh. They probably loved chatting with you. Thanks Judy. The city has changed so much in the past 10 years, and it’s orders of magnitude different from the way it was when I lived there. I have been back many times, but I hadn’t been there since 2006 and I was stunned at how many new buildings there were and how many are under construction. When I lived there, I think there were four noteworthy skyscrapers. 89-day stints in the summers helped finance college. I never went postal on anybody though. Enjoyed your post, Dan, and your images are great. Very educational and I like that. As always, Dan, you post cool door photos and a story to match. Seattle is one of those cities I’d like to visit, it looks so interesting. Thanks Mary. Seattle is a great city, but if you visit, make sure you leave enough time to get out and into the mountains. The Cascades and the Olympics are beautiful places to visit, and there are tons of cool day-hikes you can take. It’s amazingly bike-friendly too. Great captures, Dan — totally jealous of your trip! Nice collection Dan. I haven’t visited Seattle yet, hopefully one day soon. I really loved that whole entranceway to the Pioneer Building. Splendid! Looking forward to see the other Seattle doors, what a great city! Thank you. It is a beautiful city and the surrounding area is equally as impressive. Great series! It’s been more than 10 yrs since my last visit to Seattle. Space Needle was fun, and the views terrific. Thanks! I was thinking that these letter boxes must be being torn out of places fairly often. I wonder if they are available at some restoration dealers. They would likely cost a fortune but they are beautiful. I was torn as to what to run with. I thought about waiting and featuring the Pioneer Building later, but it was the original tall building so I felt I had to include it today. I love that building. You can always do a solo piece on the Pioneer Bldg sometime in the future. It looks gorgeous. I looked for the Restoration Hardware store online, but it seems they’re out of business. :( The UK has some interesting letter plates…not slots, but I didn’t see any in Venetian Bronze , so I’ll continue hunting. Thanks for sharing that beautiful letter box. I wouldn’t have thought to hunt for a special letter plate at all. Great shots! I literally just read another post this morning about Smith Tower (from Stephen Travels). What a coincidence! I have family in Seattle and can’t get there as often as I would like, so thank for the photos! Thanks! That’s funny about another post on the Smith Tower. I would never guess that could happen. I wish I had had more time, but I was actually in the city less than 48 hours. I’ve been back a bunch of times, and I’m sure I’ll get back there again. Yes, it’s tough when time is limited! I always cram in what I can though if I’m on a business trip! Interesting tour of Seattle doors and buildings. I like the Pioneer Building archway. Thanks. The Pioneer Building seems to be a crowd favorite. I love the building even more than the entrance. I wish I had had time to get more/better photos of it. You had me at Seattle haha, I’ll be spending a lot of time there from now on since my son moved there just yesterday! Hub’s home office is there but I have never been able to accompany him, now I’ll be spending most of my life in Seattle. Thanks. I look forward to upcoming posts from you about the city. I hadn’t been there since 2006 and so much has changed, AND SO MUCH is changing now! I can’t really say. It was always a pretty expensive place to live, and that doesn’t seem to have changed. It’s expensive to live everywhere, it seems. Must be nice to fly across the country to photograph doors ! Great shots . Yeah . It’s tough . I feel for you , Dan . what an elegant letter box door. through you photos it surely seems like a nice day exploring/revisiting the town. I agree with your idea of defining the height of buildings. nice photos. Thanks. I was only there on two days. One nice morning and one nice afternoon. Walking seemed to be the best way to get reacquainted but I was amazed at how many new buildings had sprung up since I was last year. Wow, so many skyscrapers. The tallest building in Ireland is the 279 foot high Obel Tower on Donegal Quay, near Belfast city center. Technically, that’s the UK. In the Republic, the tallest is The Elysian in Cork City, at 233 feet. That’s quite a difference. I must say, as much as I like the skyscrapers, I liked the old section of town better. The buildings are distinct and attractive. That corner of the Alaska Building won my heart. So sad to hear you describe the rest of it, though.Why? why? Why? I don’t know. I can only imagine how beautiful it was. Thanks for the comment Lois. I haven’t been to Seattle for too many years. Love the letter box. I see we’re both rule breakers this week. 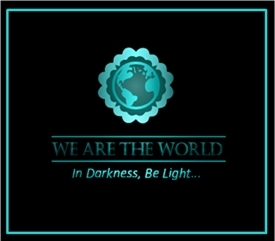 :-) Like the gallery. Thanks Deborah. Seattle is a very pretty city. When the skies are really clear, and you can see the Olympics and the Cascades AND Mt Rainier, it’s one of the best scenes on the planet IMO. Thanks Amy. If I captured something special, it was a happy accident. I have become a much bigger fan of history than I was in high school, as I’ve grown older. Given how many historical buildings get torn down to make way for something bigger, I am always happy to see some of the old timers remain. And I as well. America has this crazy philosopy to tear down old to build bigger and newer. I LOVE when old is restored and kept. There is this one bridge I keep meaning on capturing which is to me a marvel, yet I have heard talk that the authorities want it to come down to build a modern day bridge. I hope that does NOT happen!!! Moden bridges are usually boring. Great pics, Dan, and some fantastic doors as usual. Your travels lend themselves well to this series! The closest I’ve gotten to Seattle is Portland, Oregon, which I really enjoyed. Hoping I get a chance to return to the Great Northwest and that I get to visit the coffee capital of the U.S. In the meantime, your pics are a nice foretaste. Thanks Paul. I like Portland a lot. I have friends there still from when I lived in Seattle in the late 70s. If you head to Seattle, go in July for the best weather. The PacNW an amazing place. Although, I am late on this one, but I absolutely enjoyed this. I love Seattle, well mostly I see it in movies like 88 Minutes, The Changeling, Disclosure and my most favorite The Ring. The pictures are so beautiful. Just curious, how much time does it take to fly from Connecticut to Seattle? Thanks Sharuck. It’s about 5.5 hours in the air, but there’s no direct flights so you have to add about an hour and a half layover. This was fantastic. I had no idea Smith was also of Smith Corona and Smith and Wesson. Beautiful photos. Thanks John. I was surprised to learn how long the tower stood as the tallest building west of the Mississippi. Not a fan of heights Wendy? Sorry. It was a beautiful day but I wish the mountains were visible. Thanks! Seattle is a fun city. I enjoy going there and took the underground tour on my last visit. When you get tired of seeing the heights, you might take a look below the streets! I did that tour many years ago, but it was fun. Maybe next time I’ll head back underground. Thanks for the comment. Another truly interesting post from you Dan. Thanks — very enjoyable. Loved all the pictures. That one with all the skyscrapers… I didn’t realize Seattle had so many. I guess I thought of it as a smaller city than it actually is. But by my terms, small cities are much preferable to large cities. Have a great weekend. Hugs! Thanks Teagan. Seattle was much smaller when I lived there. At some point in recent years, it was the fastest growing city in the states. I tend to like smaller cities too. Even though I was brought up in Denver and have visited places like New York City, I have never been at the top of a skyscraper and it’s something on my mental bucket list. I’ve been at the Empire State Building and the Space Needle, but they aren’t skyscrapers — just kind of tall buildings. I guess I just want to be in the clouds peering down at the earth. I’d give yourself credit for the Empire State Building, although it’s been eclipsed many times over. It was the tallest for a while. Having grown up in Denver though, you must understand the beauty of mountains. That’s one thing I miss from living in the pacific northwest. Thanks for the comment Glynis. The Rockies are majestic and are a blast to visit. Living in between all those rocks though is a little claustrophobic though. Here I sit in the mountains of Tennessee with all of the oodles of trees. With my claustrophobic tendencies, you may wonder how I handle it. I live on the Cumberland Mountains Plateau, the highest point in all of Tennessee. Because it is a plateau, much of the trees are gone because of farmland and ranches. I feel as if I haven’t left the high plains of Colorado. I love the pacific. The water, itself is undeniable. The water, itself, is alive! In Oregon, there’s a beach called Gold Beach. I can’t fathom why it’s called that because the sand is white and fine. The place is oozing with serenity while the ocean’s humongous waves beat against its shore. I’ve been to Gold Beach. When my daughter was still in high school, she traveled with me to San Francisco for a conference. From there, I took some vacation time and we drove up the coast and then over to Portland. We stopped at almost every beach along the way. I haven’t spent much time in or near the Rockies or in Tennessee for that matter. They both offer some beautiful sights to see. Thanks for the tour of the city I need to get to soon. PS: I love words I don’t come across often. Yours: terra-firma…awesome! Thanks Elizabeth. I love learning new words to and I pick up so many from the blogs I follow. Thanks Deborah. I left in 1981. You must have seen the start of the growth cycle. I was back in the late 90s and then a few times in the early 00′ but I was surprised by the growth this time. I’m glad you liked the post. I left in 1988. I went back in the early 90s and change was in the air, but I feel like I “escaped” before things got crazy. From the people I know who still live there, it seems like one of places that has handled its growth better than some others. I like the trip down memory lane. My favorite activity was packing a picnic and riding the ferry to Bremerton and back. A floating picnic was great fun. That is a beautiful way to spend the day. I think they handle it pretty well, but it seems pretty expensive to live there. That letterbox! Artistic, beautiful. I also like the columns of the Pioneer Building.